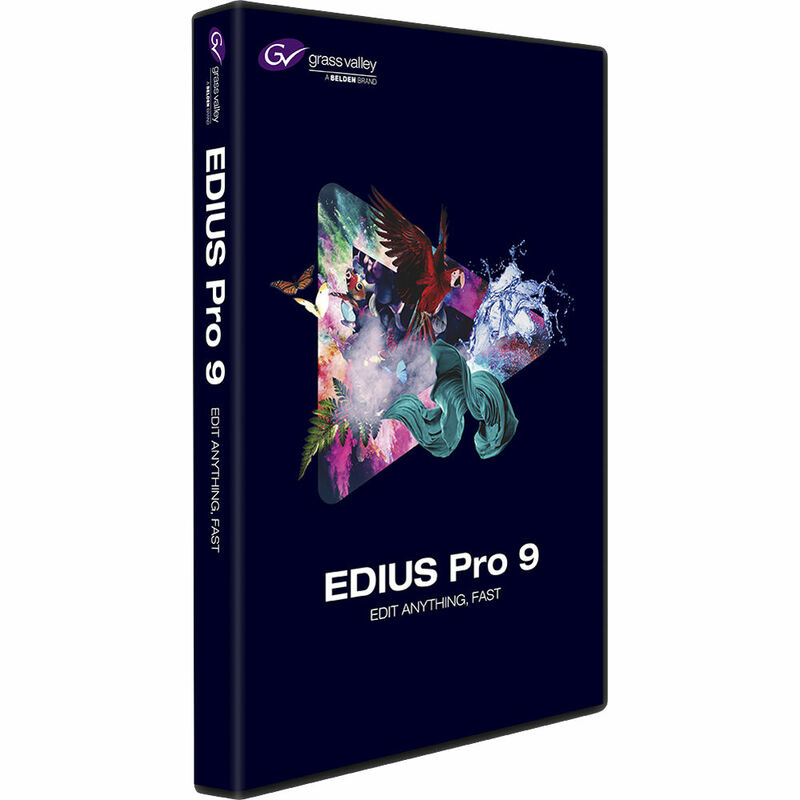 Grass Valley EDIUS Pro 9 nonlinear editor provides native support for virtually all commonly used file formats, such as XAVC/XAVC S and AVC-Ultra/Intra, and allows for real-time editing of multiple formats and frame rates on the same timeline. EDIUS Pro 9 is designed as a native 64-bit application for Windows operating systems, and takes advantage of system memory for intensive media operations such as layering, stereoscopic 3D, multicam, and multi-track 4K editing. EDIUS Pro 9 supports resolutions from 24 x 24 to 4K x 2K on the same timeline, and converts between HD/SD and HDR/SDR resolutions, aspect ratios, and frame rates in real time. You can edit in HD and place 4:3 video on the timeline, mix NTSC and PAL sources, add 4K content, or combine everything into projects in other resolutions and frame rates without waiting for any conversion or rendering to process. In addition to native format support, you can take advantage of Grass Valley's 10-bit intermediate codec, HQX, or even Avid DNxHD via an optional add-on. The application can be installed on two machines, and you can edit in proxy mode if one of the machines isn't powerful enough. Note: This Educational version requires proof of full-time educational status and is not upgradeable. Note: Multiple CPUs and/or multicore CPUs are recommended. Graphics Card Must support higher resolution than 1024 x 768, 32-bit. Direct3D 9.0c or later and PixelShader Model 3.0 or later required. Requirements for video memory size when using GPUfx will vary depending on the project format. For 10-bit SD projects: 1 GB or more recommended; for HD/4K projects 2 GB or more recommended. Hard Disk 6 GB of hard disk space is required for installation. Drive with SATA/7,200 RPM or faster is required for video storage. Available hard drive disk space should be twice the size of the file to be edited. RAID-0 is recommended for HD and above resolution editing. EDIUS Pro 9 (Educational, Download) is rated 5.0 out of 5 by 7. Rated 5 out of 5 by Andrei from Fastest editing tool on the market I use EDIUS 9 because of its quick response. I use my intel i7-2600k with 16GB ram (6 year old build). I can use 3 HD footage layers at the same time without any problems. Color correction tools are great. Excelent feature in my favorite program is optical flow slowmotion, stabilization tool. You don't need to render clips after applaying slowmotion, stabilization, color correction. I my case I just push play button and see my timeline in real-time (6 year old build! dual fullHD monitor with no graphic card on board!) I don't know how they managed to do this! Rated 5 out of 5 by frankie from excellent, edit H.265 easily use intel QSV, no need powerful graphic card, edit 4K footage easily on a i7 laptop. Rated 5 out of 5 by Pedro from AMAZING just perfect, as i espected. Hi, I am working with Edius Pro 8 Education ver. 8.53, and would like to upgrade to Edius Pro 9 Education. Is there an update version, or do I have to buy the Pro 9. If I have to buy the new program what would then happen with the (old) material that is allready on the computer? Our understanding is there is no further updates; you must do the upgrade. Regarding what is on your computer, the Pro 8 software will remain as well as your project files. can we sync. 3 or more video clips automatically like in fcpx? Yes, you can sync 3 or more video clips. Can China buy it on the mainland? Yes, this is a Digital Download which is available for international orders. The Educational Version of Edius Pro 9 is the same as the standard version, the only difference is that you must qualify to activate the program. To qualify you must be either a Student or Teacher at a School or University. After you purchase the program from B&amp;H, Grass Valley will contact you directly for proof of your eligibility before the program is activated for use. what is the minimum education level needed to qualify for academic license? can I purchase academic license using a middle school student ID card? Can it be explained that the educational version needs a full - time certificate of education and not to be upgraded? That is correct, the Educational version requires proof of full-time educational status and is not upgradeable. Please keep in mind that this is actually less expensive than the upgrade options for the non-educational versions. If you are a student at Taiwan University, can you use the educational version?